2016 has been a monumental year and, to be honest, one we’re glad to see the back of. Brexit, Trump, Syria, the passing of Bowie, Prince, Leonard Cohen, George Michael, Carrie Fisher; the list goes on and on. Not one’s to dwell on the negatives though, we were determined to leave this mess on a high and so, via our fund raising for Refugee Action, that’s exactly what we did. It’s important to all of us at WeGotTickets to be more than just a ticket agent, and so each year we work with a few select charities to help give something back and help effect positive change. The refugee crisis and the rise in reported xenophobic attitudes that came with it was something that all our staff felt strongly about and so we wanted to help out in any small way we could. We settled on raising money for Refugee Action, a fantastic charity that speaks out to defend refugees’ rights to safety and fair treatment and makes a real difference to the lives, hopes and well being of individuals and refugee families arriving in the UK. Simply put, they help them build new lives in peace and with dignity and hope. 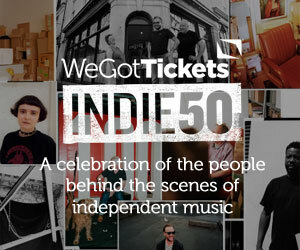 That’s why in December we offered our customers the chance to donate when purchasing tickets on our site. On December 1st, when we started collecting the donations, we were immediately overwhelmed by the response and touched by the generosity of our customers. We’ve run similar campaigns in the past but this one immediately surpassed our initial estimates. On the first day alone we raised almost £500, and by lunchtime on the third day we had passed the £1000 mark. It usually takes a week to reach this. Come the end of the month, our customers had donated a staggering £9236, an amount that is sure to make a real difference to this amazing charity. With added funds raised by our own staff hosting a cake sale at the East Oxford Independent Art Market, and from the clients we have pointed towards using Support Act (check them out here if you haven’t already) it’s an even greater amount, and one that we can all be proud of. 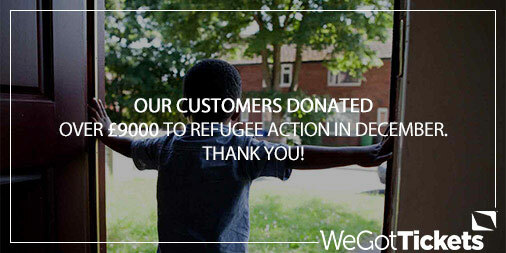 Apart from the money pledged, we also offered customers the chance to post welcome messages for Refugees arriving in the UK to be displayed on our site and handed over to Refugee Action for use in their centres around the country. Again, we were inundated with messages, receiving over 500 in total, all of them welcoming people to our country, sympathising with the struggles they had experienced and celebrating their contribution to our culture, economy and society. We found these genuinely heart-warming, and they helped restore some of our lost faith from the last year – Take a look for yourself. £9236 – I’m sure you’ll all agree it’s an amazing amount, and we’d like to thank everyone who supported, donated, left a message, got in touch to voice their support or just helped spread the word. Thanks to Refugee Action too, their work is more vital than ever so please do continue to support them to help ensure that this positivity is continued well into the new year. 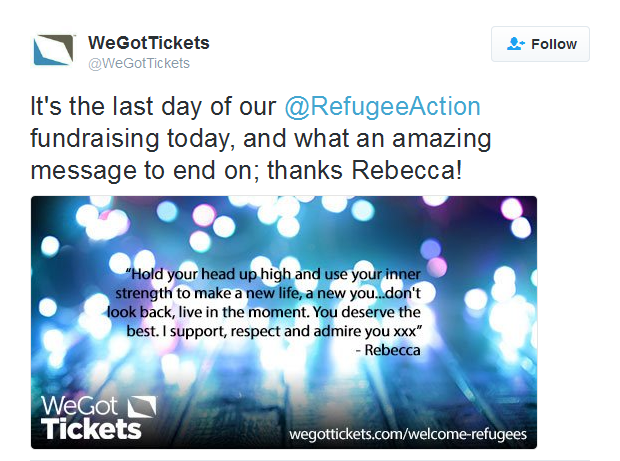 Follow Refugee Action on Facebook and Twitter, or read their blog, including our guest post “Raising funds and hope for refugees one ticket at a time”.